The break-in process described in Quick Guide to Bassoon Reed Tuning can be sped up with the use of a food dehydrator. Be sure that the reed is thoroughly dried out between cycles. Even with quick drying, be sure to do at least 5 cycles. If you hear the reed crackling as it’s drying out, it’s not ready for testing. Repeat the break-in process until the crackling is gone. Run the fingertip up the channels noting any high spots or imbalances. Make correction by light sanding prior to testing. See also Fixing Tip Opening Symmetry Problems and Tap Tone Tests. Is the knife sharp? Carefully run the blade across your fingernail. Does a new knife have a scraping burr? How do you know? See Knife Sharpening for more information. Why is it important to round the tip edge of the knife blade? Many tests in the Quick Guide to Bassoon Reed Tuning call for scraping a narrow line in the blade. For instance, Test 2 (Fig. 2A, 2C), Test 3 (Fig. 3A, 3B), Test 4 (Fig. 4A), and all Middle Register channel adjustments. 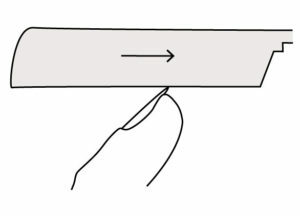 Place the tip of the knife at a low angle to sharpening stone, press down and move the blade in an arc in one direction, then reverse the knife and do it in opposite direction.